“Guangzhou is lit!” squeals my son, pun totally intended, his face illuminated by a giant radiant pig. He’s right, the city is indeed luminously lovely from the thousands of red lanterns lining its streets. 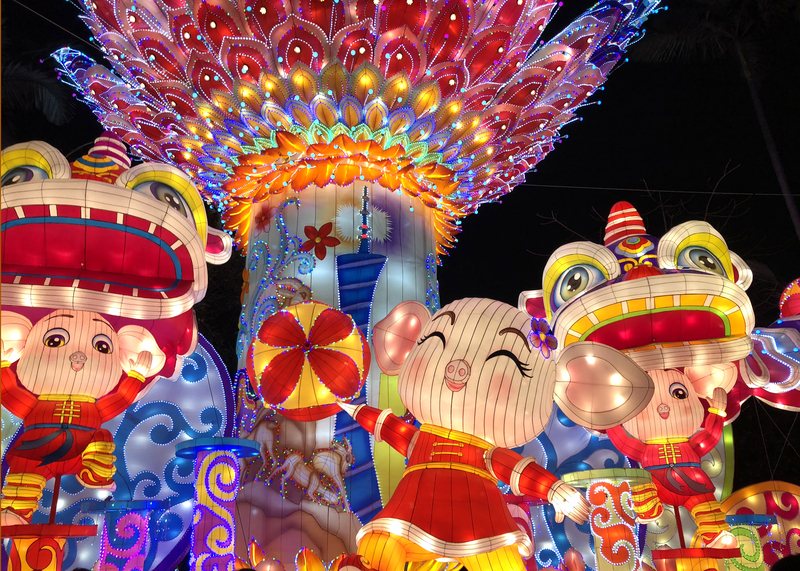 An epic lantern fair in Yuexiu Park takes it next level, and we can’t resist joining the throngs of families to view more than 50 multi-storey lanterns. 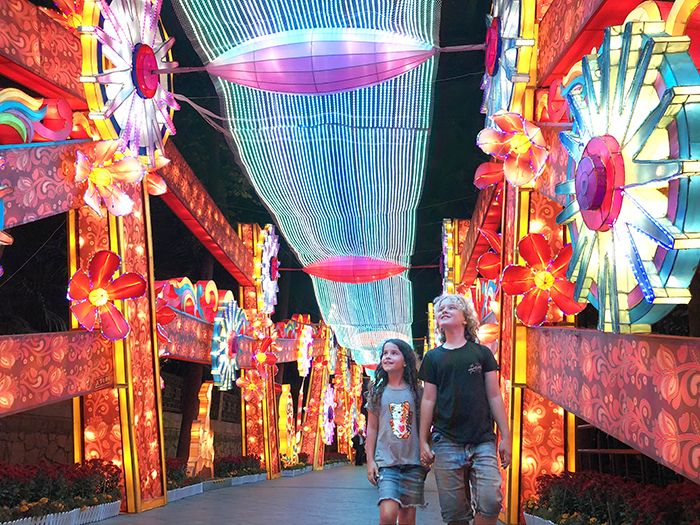 Themed around animals, including the star of the 2019 Chinese Zodiac, the pig, the lantern fair also boasts supporting acts in the form of giant glowing dragons and fluoro fish that leave the kids wide-eyed with wonder. So why are we in Ghuangzou? Well, Raff and Sugarpuff have been learning Mandarin at school and all that scholarly Ni Hao-ing has left them with a bit of a crush on China, so we’ve come to celebrate Chinese New Year. And if these lanterns are anything to go by, it’s going to be quite a shindig. 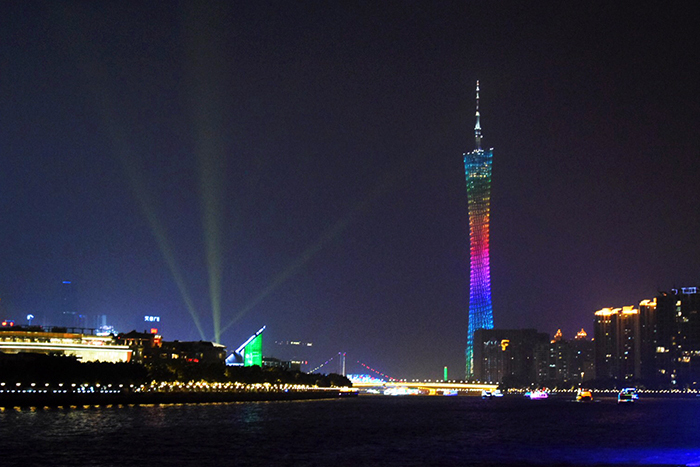 Guangzhou, China’s third largest city, has certainly donned its party best for the occasion. Along with the litany of lanterns, colourful fresh flowers and tangerine and kumquat trees burst out of heaving Spring Flower markets, and the streets are overrun with litters of comical cartoon pigs, representing happiness, prosperity and indulgence – the latter something we embrace heartily at a series of banquets over the coming days and nights. 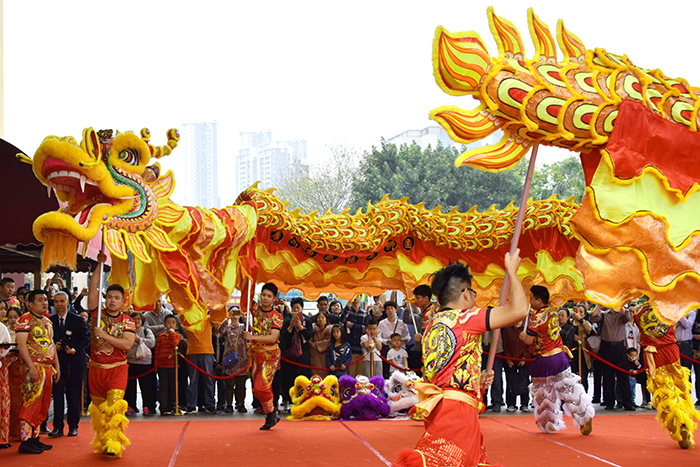 In China, Chinese New Year is a time for family, reunion and togetherness. But that’s not to say we’re not welcome too, the friendly people of Guangzhou embracing Raff and Sugarpuff like long lost relatives. 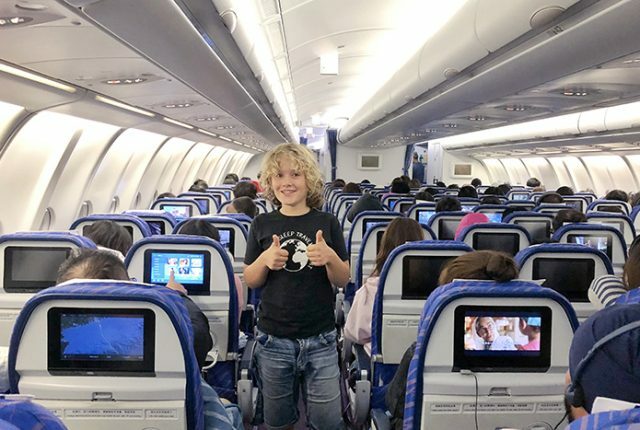 Indeed, my boy’s curly blonde hair proves so popular it practically needs its own PR agent! There’s more colour as family homes are festooned with decorations to drive away bad luck and welcome in the good stuff, which means a heap more of those radiant red lanterns, as well as chunlian (good wishes scrawled in Chinese calligraphy, in black ink on red paper) paper cuttings of auspicious plants or animals, and paintings of auspicious legendary figures. And, of course, there are plenty of those blooming flowers and kumquat trees from the markets. 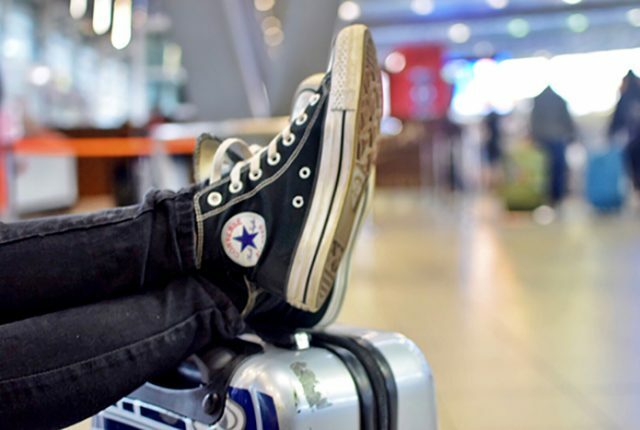 Many people make the journey back to their hometowns to join their extended families for lavish reunion feasts. You see, the real star of the Chinese New Year festivities is food, and familial eating marathons see tables laden with dishes that symbolize wealth, including whole fish to represent completeness and abundance, two-foot long changshou mian (longevity noodles) and plump jiaozi (dumplings said to resemble ancient gold ingots). 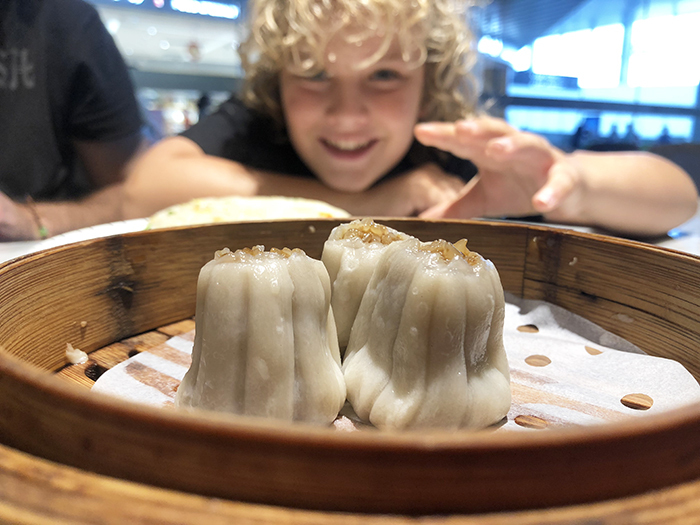 When Raff hears that the more dumplings he eats during he festivities, the bigger fortune he will attract over the coming year, he sets what might be a world record in jiaozi consumption. Seriously, if there is any truth to the tale, the kid’s going to be a billionaire by June. Decorating extends to one’s person on the first day of the New Year with everyone donning new clothes from head to toe, the redder the better, because the vibrant hue symbolises vitality, happiness and luck as well as pulling a double shift by scaring away spirits of bad fortune. Speaking of red, my avaricious offspring become particularly enamoured with the red envelopes they are handed by everyone from our hotel manager to complete strangers. Because they are filled with cash. Like Christmas in the West, gifts are exchanged during Chinese New Year, only in the form of Ya Sui Qian, red envelopes filled with “lucky money” to bring good luck and ward off monsters. 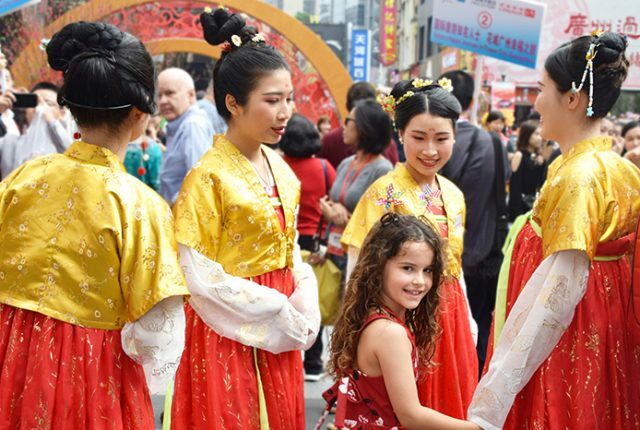 As we explore the colourful streets, the kids are greeted with cries of “gong hei fat choy” and more of those tantalising red packets, some holding cash and others chocolate coins. 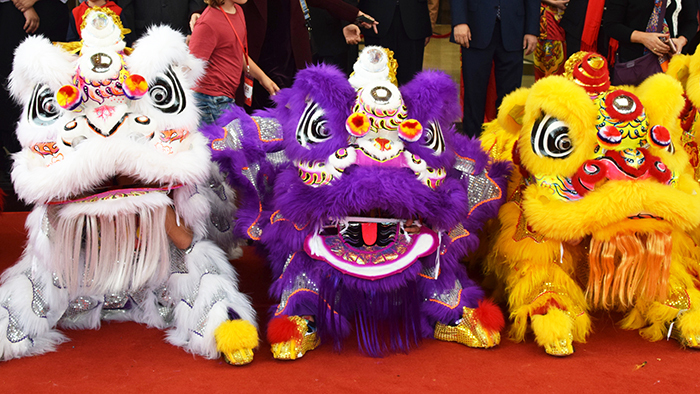 Traditional lion and dragon dances break out, the kids jigging wildly to the very loud and extremely vigorous drumming that accompanies them, before helping to feed the mythical critters lettuce. The lion symbolises strength while the dragon represents power and their presence is said to bring good luck and fortune (although not to my eardrums). It appears to be effective too, because we’re feeling very lucky indeed to be celebrating Chinese New Year here. Of course, we eat. Frequently. 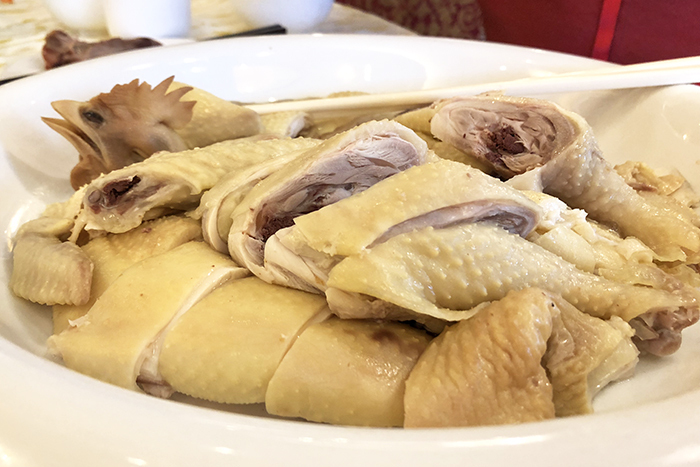 The birthplace of the Cantonese cuisine that most kids know and love, there’s something for everyone in Guangzhou. We gobble lusciously fatty goose that’s been blown, smeared with fragrant seasoning, boiled, chilled, air-dried and then roll roasted over flame for the perfect crispy skin. Raff virtually inhales platefuls of succulent char siu Pork and moan-inducing crispy roast pork that we nab from a hole in the wall barbecue vendor. We banquet at the enormous Panxi Restaurant, adjacent to Litchi Bay, filling up on white cut chicken, whole braised fish, sticky pork ribs, gelatinous fèngzhǎo (chicken feet) and bowlfuls of fluffy fried rice. At Huifu Snack Street we dive in to a maze of steaming, sizzling and sometimes smelly street food. 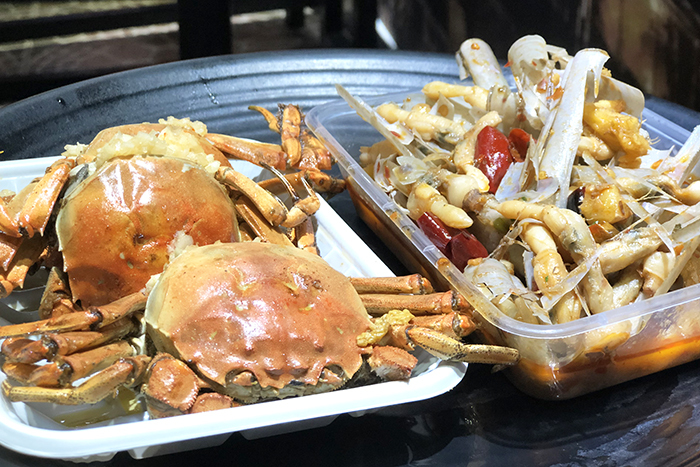 Raff and I brave piles of random stuff on sticks, stinky tofu, stir fried hairy mitten crabs, garlicky oysters, chilli laden razor clams and even a little organ stew, my boy leaving the local vendors awestruck at his superior eating skills. 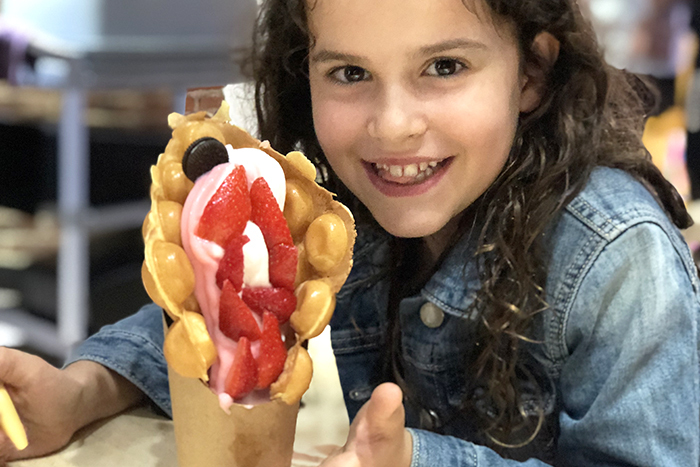 Though a slightly less courageous Sugarpuff skips the extravaganza of unidentifiable eats for an enormous rolled waffle stuffed with strawberry ice cream, cream and fruit. 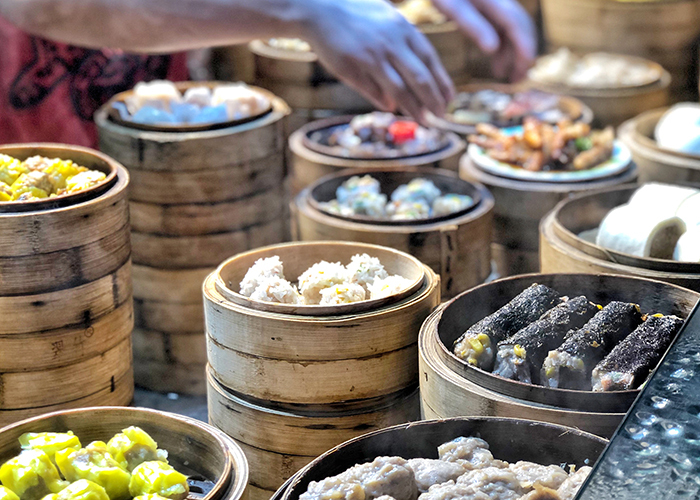 But it is the tables stacked high with dim sum, a culinary art that originated right here in the former Canton, that my very hungry family finds most irresistible. 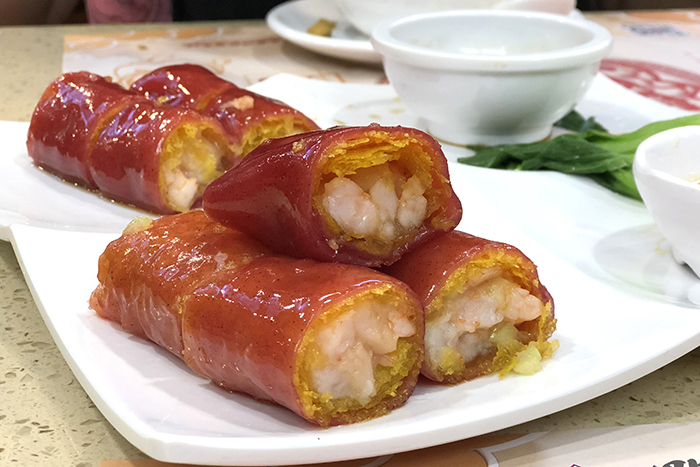 However, Dim sum in Guanzhou does not come without challenges as there are no trolleys and the picture-free menus are written entirely in Mandarin. 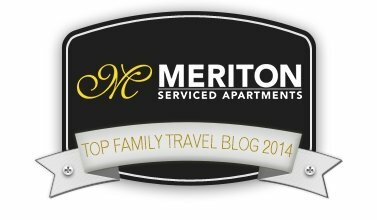 But by communicating via a thoroughly effective hybrid of pointing and and interpretive dance, we manage to munch our way through steamers full of fluffy char siu bao (barbecue pork buns), shrimp-filled har gau dumplings, sublime sui mai (dim sims) and unctuous chee cheong fan rice noodle rolls. 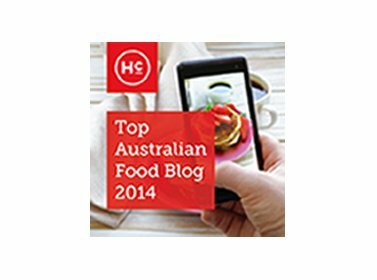 But it is the red rice noodle rolls – an addictive combination of bouncy shrimps wrapped in a crispy noodle net, then encased in a steamed rice noodle and served with peanut and soy sauce – that prove to be the stuff of last meal fantasy. 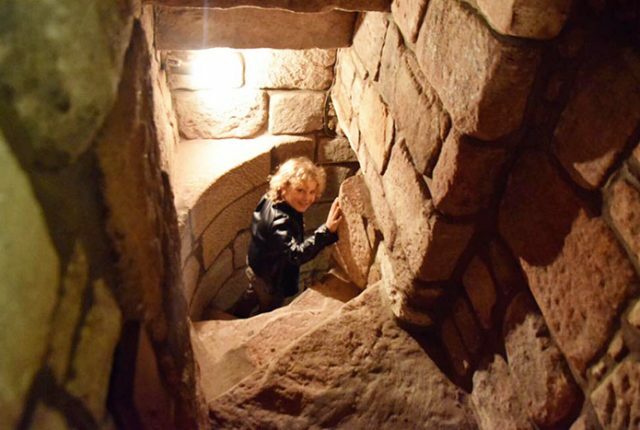 We work the surplus of calories off as we explore all the city’s sights. 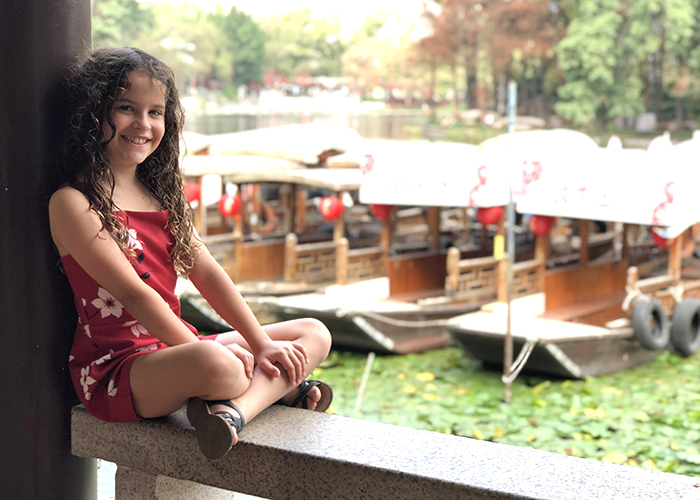 There are so many things to see and do in Guangzhou with kids, it’s not surprising to discover that it is one the world’s fastest growing tourist destinations. 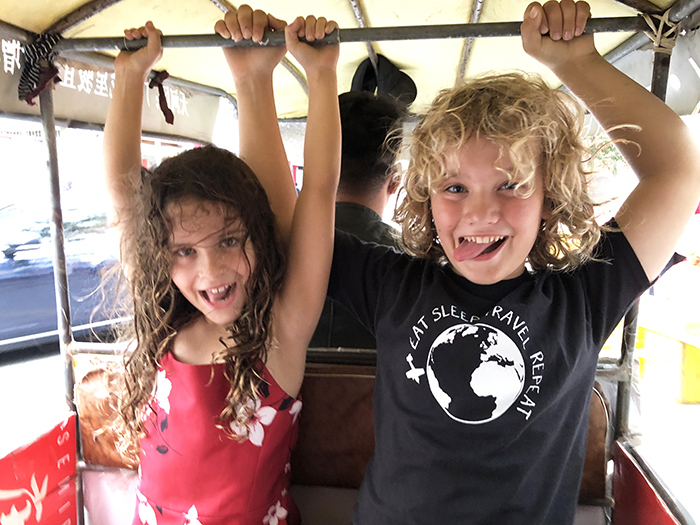 Between bursts of drumming and noisy celebration, we gad about Guangzhou in an open air tuk tuk. We start at the Statue of the Five Rams. The symbol of the city, the rams are said to have been left 2000-years ago by five colourfully dressed immortals who rode into the then barren town to dole out rice and blessings, as immortals are wont to do. We make the pilgrimage to the nine-storey tall, 1,400-year-old Temple of the Six Banyan Trees, to pray with the locals amongst swirling incense smoke. 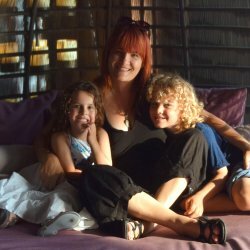 We explore pretty Shamian Island. Once a base for British and French colonial powers that became a seedy hub for the opium trade, today it is an atmospheric, tree-lined beauty with a Parisian vibe. The extraordinary Chen Clan Academy steals another afternoon. 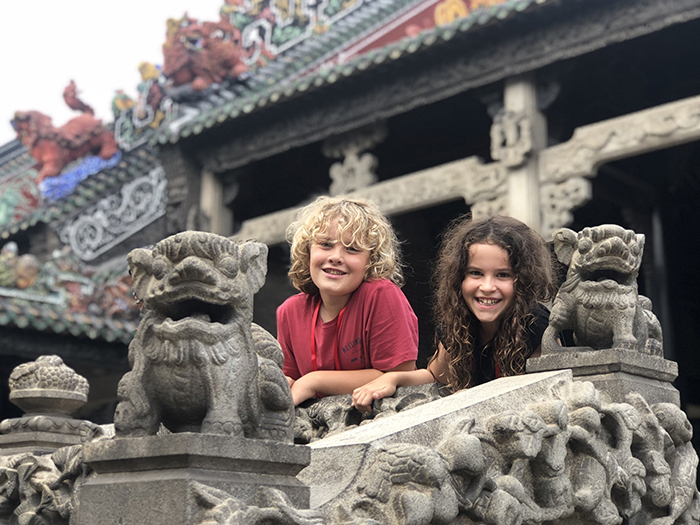 The ornate ancestral temple, now a folk-art museum, is the largest traditional structure in Guangzhou and home to a confection of carvings depicting birds, animals and larger-than-life figures from Chinese mythology that have the kids’ imaginations soaring. And at Yongqing Fang, a hipster ‘hood with alleys packed full of cool cafes and modern art, the kids roundhouse their way into the ancestral home of Bruce Lee. 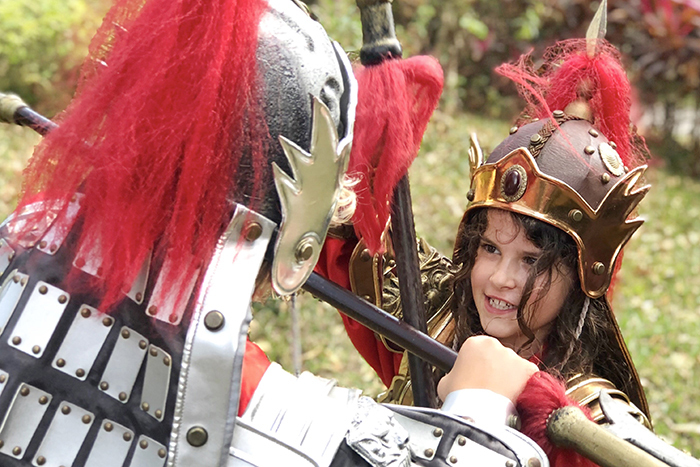 No doubt inspired by the kung fu king’s cool moves, the kids dress up warrior-style later that day to create their own ancient Chinese fight club, albeit with a backdrop of beautiful blooming tulips at Yuntai Garden, the largest landscaped garden in China. A soundtrack of amateur Chinese Opera accompanies a stroll through Litchi Bay Park, a lush grassy garden criss-crossed by a tangle of creeks and lakes. Shuttlecocks fly back and forth; hacky sacks bounce from foot to foot; and graceful locals practice tai chi as we punt under ancient bridges on a timber boat. The park is alive with activity but somehow remains uncrowded and provides an unexpectedly tranquil haven in this city of 14-million people. 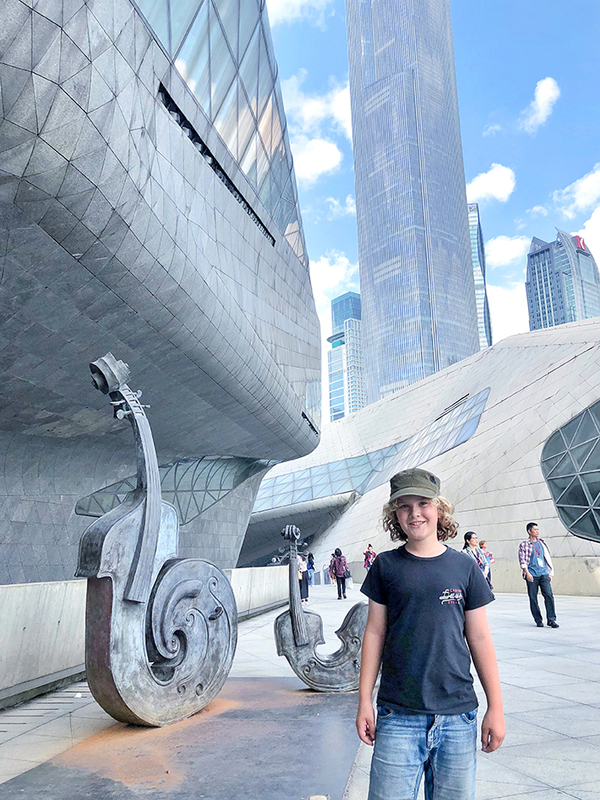 We take a leap into the future, exploring the insanely cool tangle of glass, granite and steel that is Guangzhou Opera House, a magical musical grotto inspired by the concept of two rocks washed away by the Pearl River. Speaking of magical musical grottos, Cantonese Opera brings traditional opera to life with sensory exhibits and live lakeside performances as well as interactive, technology-infused exhibits. 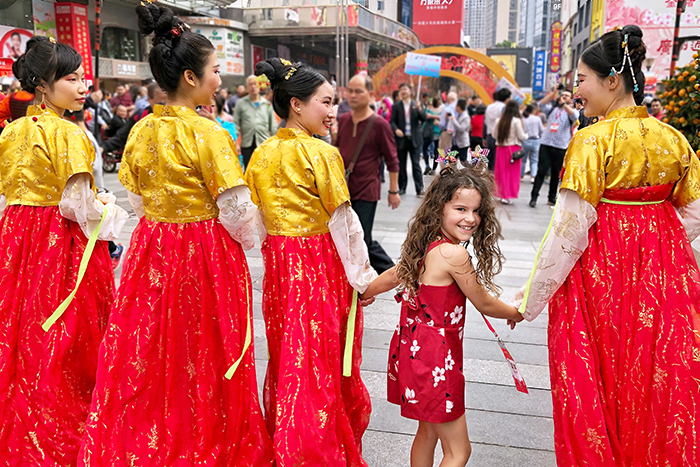 We explore Huacheng Square, the thoroughly modern public space on the edge of Pearl River in Zhujiang New Town, where Raffles and Sugarpuff offload their red packet yuan haul on flapping paper birds and rainbow ribbons to twirl and fly with the local kids. 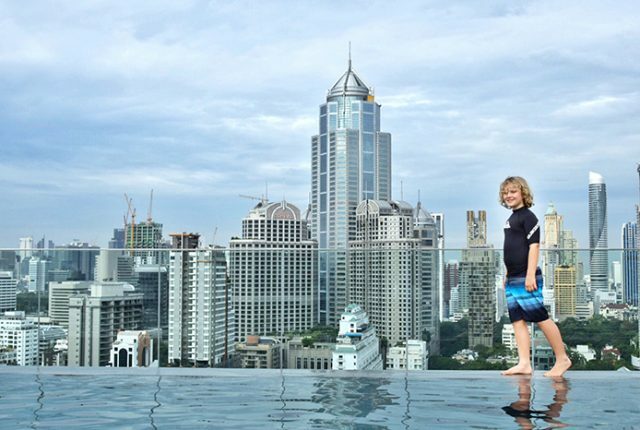 And of course, we whizz our way to the top of the 604-metre tall Canton Tower, the landmark of the city, and a must-do when visiting Guangzhou with Kids. On the 110th floor, we check out Sky Drop, the highest vertical free fall in the world and the Bubble Tram; a series of spherical, glass-enclosed cabins clinging to the outside edge of the building that rotate around the tower. And then we run away, becasue there ain’t no way this card carrying coward is getting is having anything to do with either. One of the tallest free-standing structures in the world, simply soaking up the incredible views form the 109th floor proves more my speed. The Canton Tower has more surprises in store. As darkness falls we board a boat to cruise along the snaking Pearl River for the best views of the willowy structure. Sugarpuff squeals in delight as the tower lights up “like a unicorn horn” with rainbows of coloured lights pulsing up and down its length. Personally, I find my own delight in the formerly pollution riddled port city’s forward environmental thinking. Litter is virtually non-existent, sustainable design is being integrated into construction, and the clean, green and seriously clever city’s award-winning transport system has replaced petrol-powered buses and taxis with electric vehicles. Its environmental commitment means that even the city’s expressways and overpasses are decorously strewn with evergreen bougainvillea. Beauty and brains? Now, that’s something worth celebrating. Getting there: China Southern offers direct daily flights to Guangzhou from Sydney, Melbourne and Brisbane, four flights a week from Cairns and five from Perth. 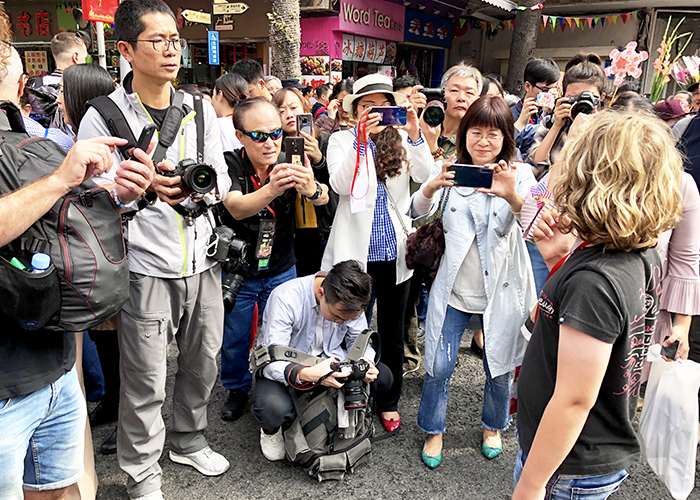 Disclosure: Elements of our visit to Guangzhou were supported by Guangzhou Tourism and China Southern but as always all red-packet wrangling, street eat scoffing and opinions are 100% our own.